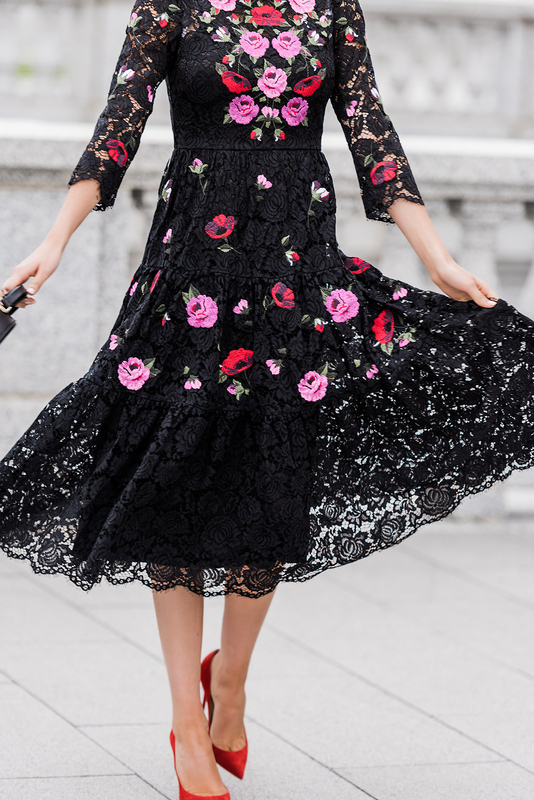 If you know me then you know I’m always a sucker for all thing floral and lace, so when I spotted this kate spade new york dress I instantly fell in love! All of their new arrivals are SO feminine and gorgeous. You can shop the newest kate spade new york arrivals here and in the widget below! Thanks for stopping by, have a great Thursday! Brought to you by kate spade new york. Are those flowers embroidered? So gorgeous! That dress is so beautiful. I love black lace and the flowers give this dress a young and modern touch. That dress is stunning! I love the deep color of the florals! This dress is so gorgeous!! Such a Dolce & Gabbana vibe but I’m sure a much better price! So beautiful!!! I love the embroidered florals. Very feminine! That dress is gorgeous! Kate Spade always make so beautiful pieces! Beautiful dress for fall! I’m loving the combo of lace and embroidery. Just love that lace dress! Kate Spade’s current collection which is in stores is absolutely majestic! I’m in love with your dress, it’s so beautiful romantic. Thanks girl! I completely agree, it’s all so beautiful! This Kate Spade dress is a romantic dream . I am always talking about purchasing pieces that are signature and classic that create a personal style. This is a perfect example of a dress beautiful today , tomorrow and forever !! Such a beautiful and feminine dress!!! I wouldn’t have paired it with red shoes but it looks really pretty!!!! I’d love to see it with PINK shoesssss!! Thanks Seppy!! Oh my gosh, yes! Pink shoes! This dress looks super on you! Love those pretty tiny flowers. Wow, stunning! This dress really is an eye turner! Thanks Lauren!! I know, I’m obsessed! Totally agree!! Kate Spade has the best dresses, especially right now! 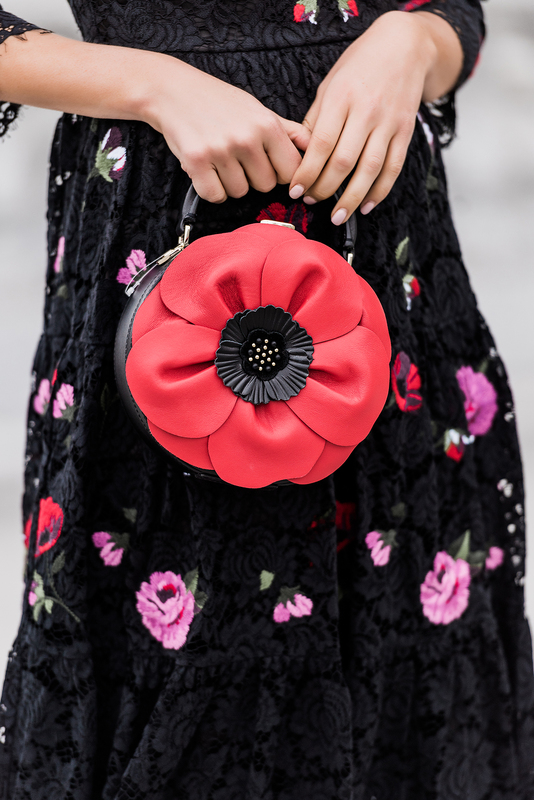 That little poppy bag is STUNNING and so lady-like! What a gorgeous fall dress! Really really stunning! Oh my what a darling, feminine look! This dress is absolutely stunning and I LOVE your accessories – particularly that clutch! Divine! Can’t wait to see your next #ootd! Subscribed. This is the prettiest dress ever! I love the embroidered florals! You little red accessories are so cute! Are you going to write a few fitness-based blog posts since you’re involved with BBG and having a meal plan/everyday workouts? I’d love to hear your tips, favorite meals or meal replacements, workouts, and active wear pieces. Looking SO amazing by the way!! Oh wow you are so nice!! Thanks Natassia! This dress is just darling! Love a good pop of red too! Hope this email finds you well. My name is Racquel and I recently started a clothing line of my own. My goal is to reinvent a modern approach to modest fashion. I have been following you for a while now and you truly inspire me everyday. Your style is impeccable and I feel like it reflects our vision to stay classy and chic. Being of mom of twin girls, I admire the way you have a work/mom balance. Seeing the chemistry between you and your babies makes me strive to be the same. You inspire all of us that have our own businesses to keep pushing. #girlbosses?? shopEllieMakir.com. I would love to send you a dress to see how you style it.